Monster Birthday Party – Dylan’s Monstrously Fun 1st Birthday! This Monster Birthday Party submitted by Nicole for Dylan’s first birthday is full of creative ideas. Read on for cheap and easy ways to help create your Monster Birthday Party theme! Nicole’s Monster party shows that you don’t need to spend loads of cash to create a perfectly decorated themed party. Here Nicole has used old tissue boxes and egg cartons cut into a monster mouth for cutlery holders. Such a fun and creative way to use household items at your party. Plus, recycling! Monster cut-outs from my Monster party printables have been attached to wooden dowels and placed in a jar for decoration. Colorful polkadot cardstock in Nicole’s party colors has been used to make party hats. Monster them up by attaching stick-on googly eyes, mouths and other facial stickers! The birthday cake and cupcakes are my favourite! The birthday cake makes a big impact with bright orange long icing strands. Pipe on a mouth (with marshmallows for the teeth) and insert an eyeball cut out for a simple but hugely effective cake. Candy eyeballs and different methods of piping the icing have created some monstrous cupcakes. Water Bottles all dressed up as “Swamp Water” with water bottle labels from my Monster party printables. Fruit Salad has been displayed in a Watermelon cut in the shape of a monster mouth. Rename grape juice as Slime to encourage kids to drink! Nicole has set up a number of activity stations for the young party guests. The 4×6 inch table signs from my Monster party printables have been framed and displayed near each activity. 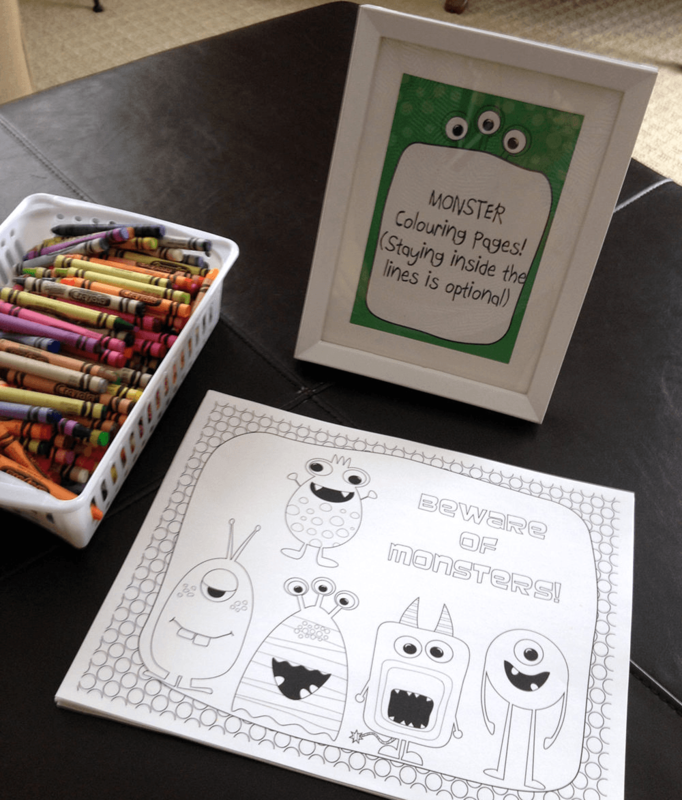 Use the Coloring in page from my Monster printables as an ice-breaker activity while waiting for remaining guests to arrive. I love the Pet Monsters. Spray paint rocks with colorful paint, and place out with goggly eyes, noses, mouths and other sticky facial features! Young kids will love making these. You can also send them home with a Monster Adoption Certificate too! Pin the Eyeball on the Monster is a fun twist on a childhood classic. Favor tags (again from my Monster printables) attached to popular Monster movies such as Monsters Inc and and a rubber monster is a great party favor idea. Or attach them to a super cute framed photo as a permanent keepsake. This is perfect for your family members. Everyone’s a Candy Monster! Nicole has set up a Candy Bar with bags for guests to create their own candy-filled favor bag. Thanks for the party inspiration Nicole! 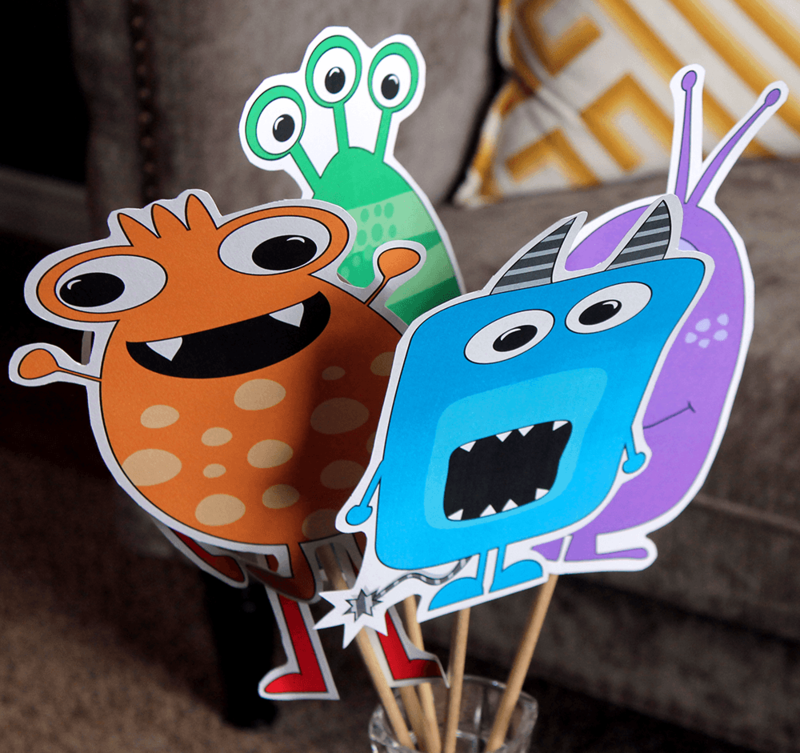 Check out all the details of my Monster party printables – a bargain for only $12.50!